Auntie’s Tea Shop is on St Mary’s Passage just off King’s Parade in the centre of Cambridge. It is only a minute’s walk from the soaring, echoing vastness of Kings College Chapel. After a morning walking around the icons of Cambridge the very name “Auntie’s Tea Shop” was an irresistible relief to Emmy and me. Images of fluffy English scones and delicately flavoured tea had already been disturbing our admiration of the town’s gothic and georgian magnificence. We took a quick look inside. It was very reassuring. Several grey-haired ladies and balding gentlemen were seated primly at smallish tables draped in lace tablecloths. Huge porcelain teapots were being tilted over delicate cups. Waitresses in demure black uniforms with white collars and white pinafores glided between the tables with trays of cakes lying among mini-mountains of whipped cream. We ordered lunch. I had ham and brie panini, Emmy had a huge chicken salad. 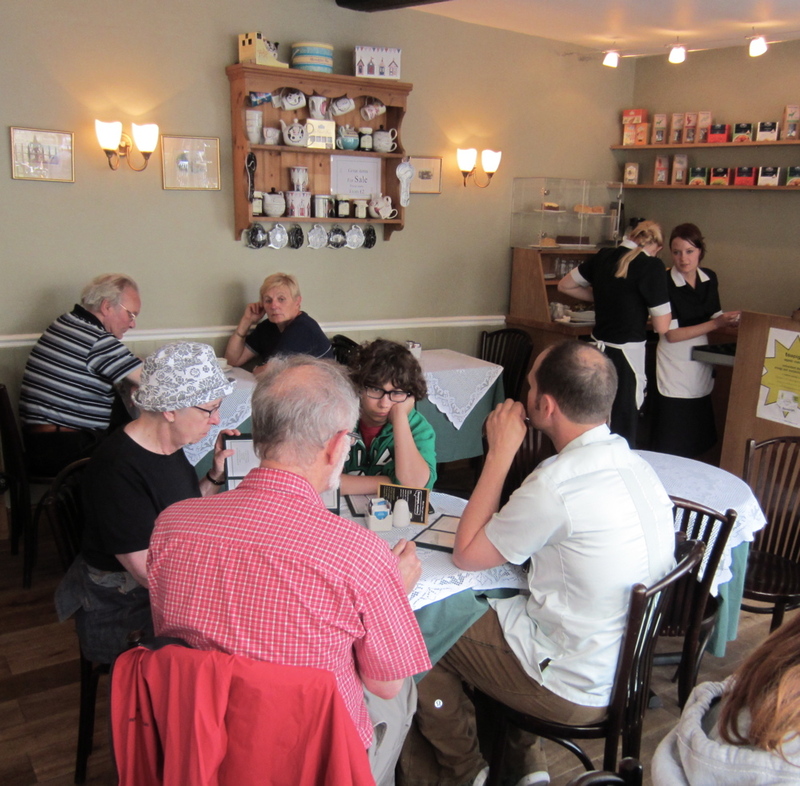 The food was good, and naturally we ordered tea – English tea. This too was as delicious and refreshing as we imagined it would be. Peering out the front window over the heads of diners on the footpath, I took in Great St Mary’s Church across the street where Richard III, Elizabeth I, Cardinal Woolsey, Oliver Cromwell and countless others once rustled their robes over the flagstones of its floor. Tea shop and ancient church… at last, the real England in one glance! This reverie was interrupted by a strongly accented voice. The waitress stood deferentially beside our table, her pen poised above a note pad, her gleaming blond hair in two plaits coiled into a bun at the nape of her neck. Polish? Czech? Ukrainian? As we ordered more tea two young women wearing head scarfs, long black coats and Reebok trainers came into the shop. There was a whispered conversation with another of the waitresses. “Just for prayers?” we heard the waitress ask. A moment later five more young Muslim women filed into the shop and headed out to the rear. A short while later they returned, quiet and polite, and filed out again into the sunlight of the street. 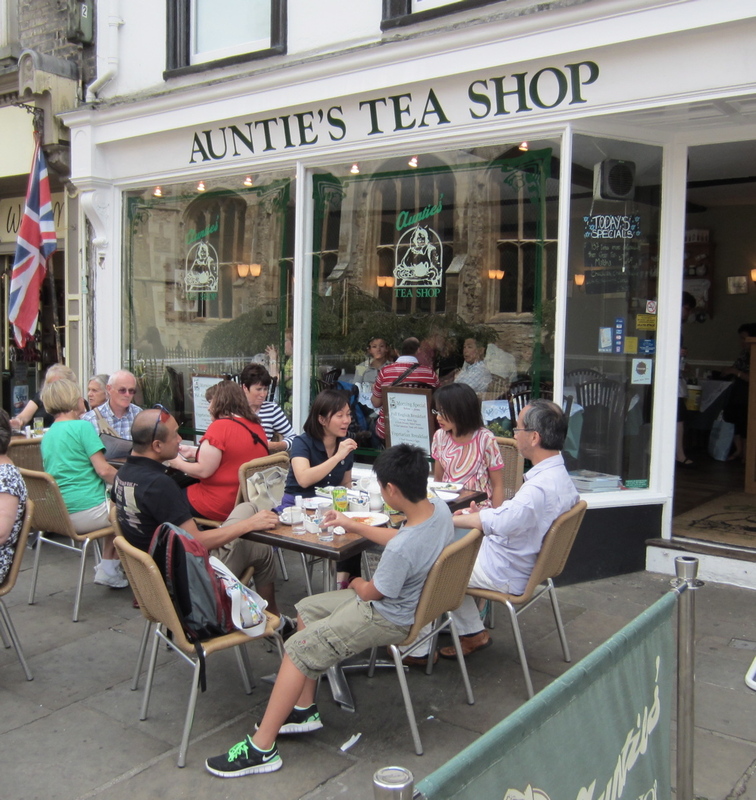 In its appearance – like the great Christian monuments of Cambridge – Auntie’s Tea Shop is quintessentially English in the carefully crafted “traditional” sense. But when Muslims pray in tea rooms, and Ukrainian waitresses serve cream scones with jam, we know that something has changed deep down. They have become part of “England” and in becoming English they have deeply changed that “England”. Of course I knew a bit about this new England from statistics, documentaries, Bend It Like Beckham, Zadie Smith, tandoori curries, the Kumars at Number 42 and a million other manifestations and caricatures of England’s migrant culture that have infiltrated into the perceptions of distant Australia. But I needed an image to hold on to, and at a micro level, Auntie’s Tea Shop in gothic Cambridge is that image. In my mind’s eye – whether accurately or wildly wrong – Auntie’s Tea Shop has now taken up residence as the stereotyped embodiment of today’s England. 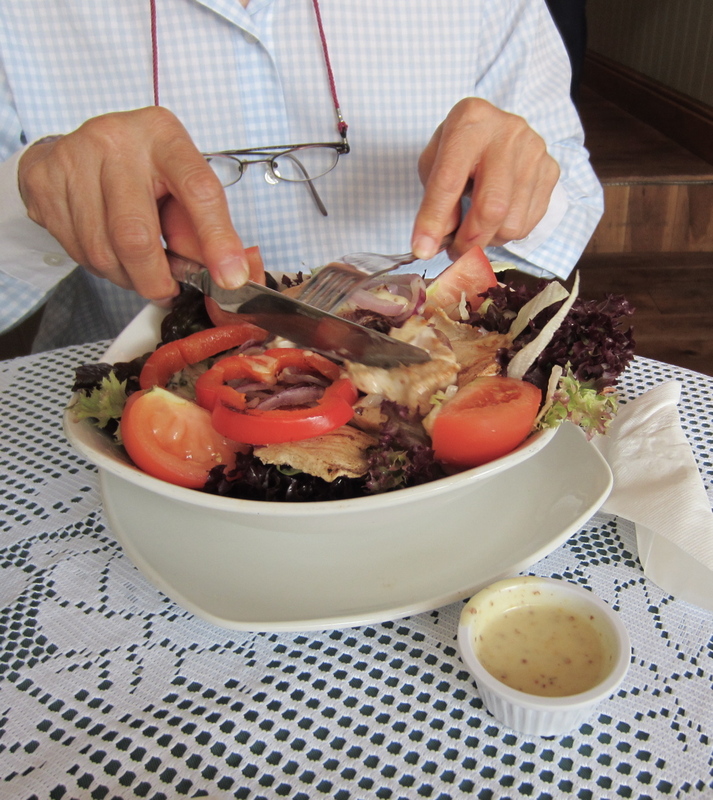 Loving the travel blog Uncle George, especially the food reviews! Thanks Ben. Some time over the next two months I’ll be posting a review of English fish and chips. I’m already deep into research on this important and somewhat neglected field.